I LOVE Amazon's Kindle Fire! I also love writing about these fabulous tablets and sharing with you all the fun things you can do with them. 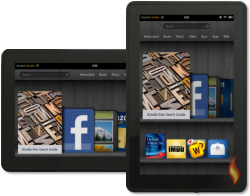 So check out all these articles and resources to help familiarize yourself with the Kindle Fire. for a list of the technical specs for all of Amazon's tablets! Each page on my site about these tablets (the linked years above) give details about these fabulous tablets- including their unbeatable prices at time of release! 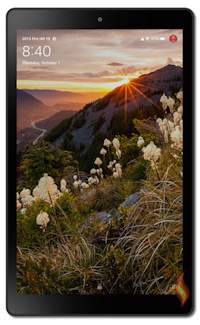 *Tablets (with the asterisk above) are no longer for sale as new Kindle Fires on Amazon. However, you might be able to buy used or refurbished ones at a discounted price, if so inclined. UPDATE: Amazon has a new labeling system for each generation of their Kindle Fires. I've updated the above to reflect this. 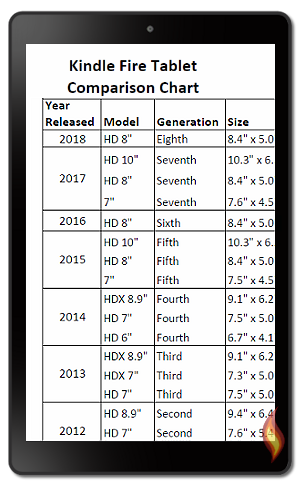 All tablets in 2011 are first generation, 2012 releases are 2nd generation, 2013 are third generation, 2014 are fourth generation, 2015 are fifth generation, 2016 are sixth generation, etc. The ones marked with a little heart ♥ are the Kindle Fire tablets I personally own, crazy huh? However, my toddler uses my first generation, my husband uses the HD 10", and I use a mix of the rest, but I do use all of them for testing and trying things out... so I can help all of you and keep these pages as updated as possible. 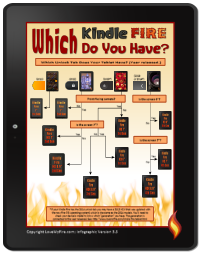 If you have a Kindle Fire but aren't sure which one you have then you're in luck! 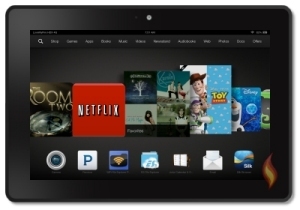 I have an article just for you: Which Kindle Fire Do I Have? With so many people getting Kindle Fires I decided it was time to put together a basic article to show you how to use your Kindle Fire! Although it's basic, this page is full of tidbits of knowledge. I go over turning your tablet on and off, rebooting, sleep mode, charging, battery power, and much more! 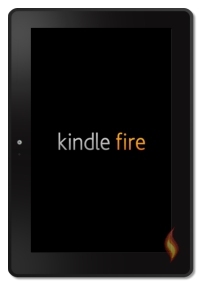 If you, or someone you know, is new to the Kindle Fire then this is the page for you (or your friend)! 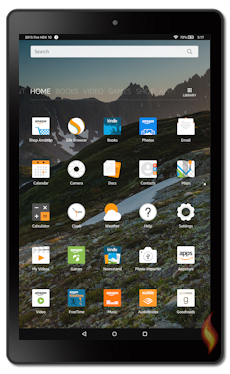 Also, be sure to read my article about the Kindle Fire Screen which will show you why it's important to protect this electronic device, then you can browse through the best accessories for keeping your tablet safe. Did I mention how much I love this portable device? In these articles I've listed a TON of the basics, including (but not limited to): apps, books, games, music, videos, and MORE. There are also a bunch of pictures to visually show you some of the awesome things you can do with this amazing tablet. And of course there are details for some of the really cool extra features, such as the Cloud Player, Send to Kindle, and Whispersync. You're bound to learn something new! I have several excellent keyboard resources for your Kindle Fire. First, there's the basic on-screen keyboard, which shows you all the options, settings, and how to use it. Next, there's my page full of keyboard tips including how to use the swipe feature and shortcuts. These will help increase your speed. Then there's my review of an external bluetooth keyboard, for those who'd like to really pump up their typing speed. I even show you how to connect bluetooth devices to your Kindle Fire. 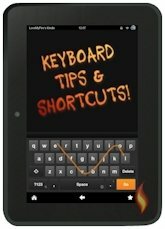 All of these resources will help you with your Kindle Fire keyboard! If you have a newer Kindle Fire and can't see the backgrounds you can unsubscribe to the special offers to see the wallpaper images. One more thing before you go... you'll probably want to check out the different ways you can protect your Kindle Fire. There are a number of accessories you can get to help keep your investment safe, such as screen protectors, covers and cases, warranties and more. You'll also want to check out digital ways to protect your device, such as using passwords and parental controls. If you will be letting children play on your tablet, see my FAQ on ways to keep your Kindle Fire safe for/from children. Yes, I love Amazon's Kindle Fire! P.S. After you've read through these articles head on over to my tips & tricks page for lots of fun tutorials.